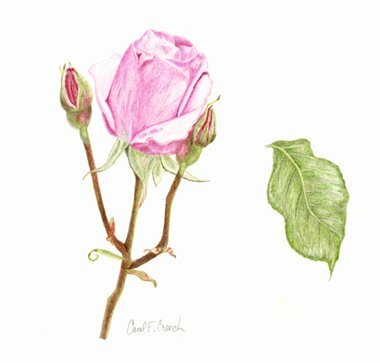 Rose – colored pencil study – finished! I did some additional work on the main flower, the stems, and also the leaf. I think it’s finally finished. It’s been a fun project to get some practice with the colored pencils. superb art, looks as though you can touch it. Wow! Thank you very much. Means a lot coming from you — I am following your leopard on the Pet Portrait forum…amazing work! You did a great job on this Carol. I find flowers hard to draw because they keep moving and eventually fade away! Thanks, Mary! Yes, I’m having fun with the colored pencils. I’d love to try some watercolored pencils next. I have some, so I just have to find some time to play around with them. Thanks, Jill and Diann!Diann – yes, I’ve been cheating a bit with the flower drawings…doing a lot from photos that I’ve taken. But I did work with the daffodil in person. They do fade fast!